Be the first to share your favorite memory, photo or story of Gloria. This memorial page is dedicated for family, friends and future generations to celebrate the life of their loved one. 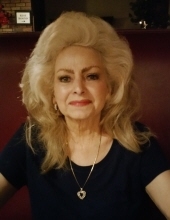 Gloria Jean Boss, age 71, of Sandy Springs, GA, passed away unexpectedly Friday, January 18th, 2019. Funeral services will be held on Tuesday, January 22nd, 2019 at 2:00 p.m. in the Peachtree Corners Chapel of Crowell Brothers Funeral Homes & Crematory. Entombment will follow at Peachtree Memorial Park, Peachtree Corners, GA. The family will receive friends on Monday, January 21st, 2019 from 4:00 p.m. until 7:00 p.m. at the funeral home. Gloria was born July 27th, 1947 in Jacksonville, Florida to the late Kenneth and Mildred Lee Heartley. She is survived by her high school sweetheart, James Stanley Boss; son and daughter-in-law, Brett and Heather Boss; brother, Elmer Heartley; sister, Patrica Metcalf. Online condolence may be expressed at www.crowellbrothers.com. Arrangements entrusted by Crowell Brothers Funeral Homes & Crematory, 5051 Peachtree Industrial Boulevard, Peachtree Corners, GA, 30092. 770-448-5757. To send flowers or a remembrance gift to the family of Gloria Jean Boss, please visit our Tribute Store. "Email Address" would like to share the life celebration of Gloria Jean Boss. Click on the "link" to go to share a favorite memory or leave a condolence message for the family.